This is Wayback Wednesday, your midweek blast from the past! In this feature, we dig into the archives, look back at the history of basketball gaming, and indulge in some nostalgia. Check in every Wednesday for retrospectives and other features on older versions of NBA Live, NBA 2K, and old school basketball video games in general. You’ll also find old NLSC editorials re-published with added commentary, and other flashback content. 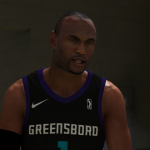 This week, I’m taking a look back at the virtual career of Jackson Ellis in NBA 2K, and the legend that it has spawned over six games. Minor spoiler alert: in NBA 2K19’s MyCAREER mode, Jackson Ellis makes a return to the virtual hardwood. One of the most memorable characters in basketball video games, this year he enjoyed his most prominent role since NBA 2K14, when he was introduced as the rival of your MyPLAYER. Not only has Ellis resonated with NBA 2K gamers, he’s clearly a favourite of the development team as well. 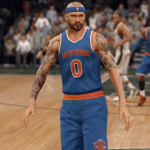 Even though he’s only stepped onto the court in a couple of titles, he’s appeared or been referenced in every MyCAREER mode on the current generation. 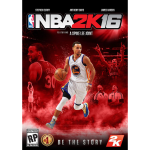 For those who may have missed the announcement, the NBA 2K16 servers are being shut down as of December 31st, 2017. As such, it would be a good idea to download any custom rosters and Draft Class files as soon as possible. To that end, TGsoGood has already downloaded some popular files for the PC version of the game and uploaded them to our Downloads section. Check them out at the links below! Welcome to this week’s edition of The Friday Five! The Friday Five is a feature that I post every Friday in which I give my thoughts on a topic that’s related to NBA Live, NBA 2K, and other basketball video games, as well as the real NBA, and other areas of interest to our community. The feature is presented as either a list of five items, or in the form of a Top 5 countdown. This week’s Five is a list of some of the quietest additions that have been made in basketball games over the years. Not all additions to basketball games receive a big announcement and a lot of fanfare, be they a brand new feature, or content pushed through during the season. As demonstrated just last week, new content in particular can be added very quietly. Of course, when it comes to the preview season, both EA Sports and Visual Concepts do tend to go to much greater lengths to inform us about new additions to NBA Live and NBA 2K. It stands to reason, as along with improvements to existing features, any exciting new additions are strong selling points that are likely to move units. With that being said, even during the preview season, there are additions that seem to fly under the radar. There are a few reasons as to why this may happen. A long time ago, the preview season wasn’t as comprehensive and in-depth as it is now. There’s also oversight, and underestimation of a feature’s appeal. Alternatively, something may be kept under wraps to keep it a surprise, though this runs the risk of wasting a good selling point. Some additions may be kept quiet to avoid potential controversy. Whatever the case may be, there have been several additions to basketball games that have had little to no hype or promotion. Let’s look at five of them. Welcome to this week’s edition of The Friday Five! The Friday Five is a feature that I post every Friday in which I give my thoughts on a topic that’s related to NBA Live, NBA 2K, and other basketball video games, as well as the real NBA, and other areas of interest to our community. The feature is presented as either a list of five items, or in the form of a Top 5 countdown. This week’s Five is another countdown, as I rank the MyCAREER stories from worst to best. Through the course of many previous articles and episodes of the NLSC Podcast, I believe that I’ve made my stance on MyCAREER stories very clear. For those of you who may be unfamiliar with my view on the matter, while I can appreciate the effort that goes into them, I’m not a fan of the concept. To me, it’s felt more intrusive and annoying, rather than enhancing the experience. It’s obviously not going anywhere, so hopefully the approach can be improved upon in future games. To get an idea of how Visual Concepts may achieve that, it’s worth reflecting upon the approach they’ve taken to previous MyCAREER stories, and determining which has been the best. We’ve had five MyCAREER stories in NBA 2K at this point, enough to rate and rank in a Friday Five countdown. 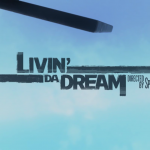 In ranking the stories, I’m taking into account the overall quality of the narrative, the likeability of the characters (including the MyPLAYER protagonist), the impact on the gameplay experience, and how well the approach fits with the RPG elements of MyCAREER. As always, please keep in mind that this is just my take, and I certainly invite you to share your rankings in the comments section below. With that being said, let’s tip off the countdown with number five. Welcome to this week’s edition of The Friday Five! The Friday Five is a feature that I post every Friday in which I give my thoughts on a topic that’s related to NBA Live, NBA 2K, and other basketball video games, as well as the real NBA, and other areas of interest to our community. The feature is presented as either a list of five items, or in the form of a Top 5 countdown. In this week’s Five, I’m offering up some more theories and alternative interpretations for the stories in MyCAREER. It’s time once again to indulge in a bit of creative writing and fun speculation! 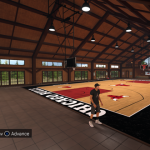 Last November, I wrote a Friday Five that took the stories that NBA 2K has implemented in MyCAREER, and twisted them around with some theories and interpretations that somewhat altered their tone. 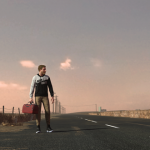 It’s still one of my favourite articles that I’ve written, as reimagining the MyCAREER stories in a darker or more dramatic light turned out to be a fun exercise. 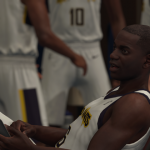 NBA 2K18 has provided us with another story to pick apart, and I have a few more ideas, so it seems like an opportune time for a follow-up article. Once again, I do have to stress that I don’t actually believe these interpretations and theories, even though I do feel that a couple of them actually fit quite well. In fact, if you told me that the first theory was indeed intentional and what’s actually going on, I wouldn’t be entirely surprised. This is all meant to be in fun though, so don’t take it too seriously. With that being said, you may find that a couple of these theories make a little too much sense. At the very least, I hope it’ll be an amusing read to take you into the weekend. Let’s once again go tumbling down the rabbit hole; tinfoil hats are of course welcome, but completely optional. 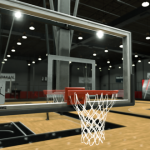 Between some of my recent columns and the weekly “Our Week in Basketball Gaming” segment on the NLSC Podcast, I talk about 2K Pro-Am a fair bit. There are other topics that I’ll be touching upon in upcoming articles, but The X suggested this topic to me on Twitter, and it was too fun of an idea to put off for another week. Since this is the Friday Five, and there are five regulars in our 2K Pro-Am squad (NLSC THRILLHO), the format lends itself quite nicely to putting together a fun write-up about our crew. The five of us started playing 2K Pro-Am together about six months ago, ultimately creating a couple of squads in NBA 2K16. Arcane and I were a little late to the party, but once the two of us joined in and we were getting in games with all five regulars, we had a lot of fun, and a few very satisfying victories. We’ve been doing a little better this year, though we’ve still got a long road ahead of us if we want to reach the Elite tier, and unlock logo importing (which shouldn’t be necessary, but that’s a topic for another time). Without any further ado, let me introduce you to the key members of NLSC THRILLHO!